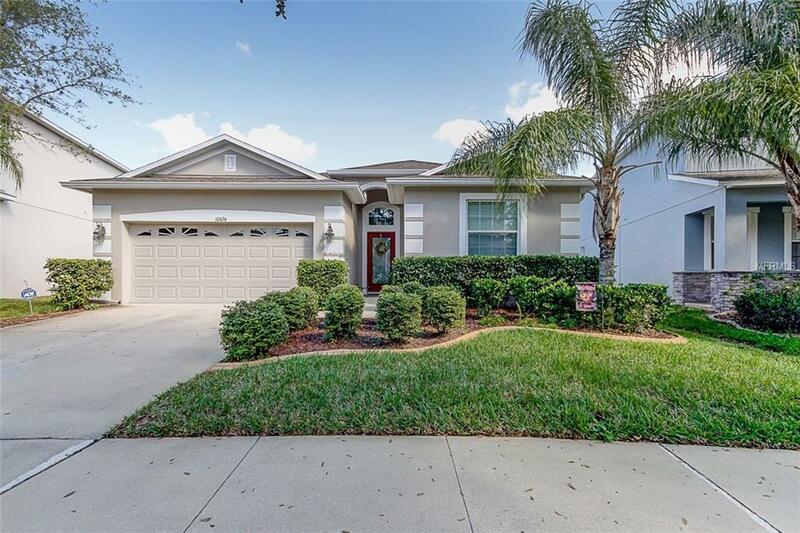 Beautiful 4 bedroom, 3 baths, 2 car garage home in the desirable New Tampa Community of Heritage Isles. Enter to a beautiful foyer with stained glass door & drop pendant lighting. Move through to the OPEN great room with tall ceilings & immediate views of the oversized rear lot with conservation. The spacious bedrooms are in a 3-way split giving everyone the privacy they deserve. The kitchen offers granite counters, walk-in pantry, stainless steel appliances & an oversized breakfast bar with room for several bar stools. The kitchen is open to the family room & dining room combo making it perfect for entertaining guests. The master retreat features 2 walk in closets & a master bathroom with his and her sinks, walk-in shower &garden tub. Relax out back on your screened in patio and enjoy the fully privacy fenced in yard and views of the conservation. Other features include new carpet and fresh paint. Heritage Isles Golf and Country Club offers resort style amenities including: oversized swimming pool with 2 story slide, tennis and basketball courts, playground, restaurant with a tiki bar overlooking the pool, events room and a full size, huge, fitness center. Minutes to USF, Florida Hospitals, the new and forever growing Tampa Premium Outlet Center and Wiregrass Mall.